Finished in two tone Grigio Scuro Opaco and Nero Opaco, two of Ferrari's most unique and expressive paints. Set on matte finish black rims that accentuate the stealthy special request paint. Flanked by carbon fiber on either side with carbon fiber rear diffuser, this Ferrari has spared no detail. This Beautiful 458 Speciale has traveled 919 miles and beautifully cared for throughout its lifetime. As with all Ferrari special series, the 458 Speciale boasts an array of advanced technical solutions that make it a completely unique model designed for owners looking for an even more focused sports car offering extreme driving emotions. 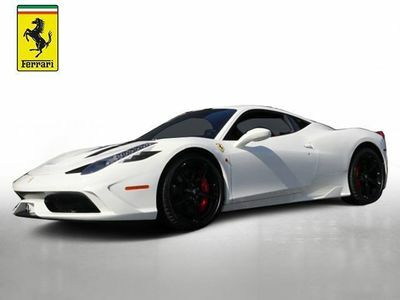 Complete options list for this stunning 458 Speciale are listed below.